A new identity for a Melbourne institution. 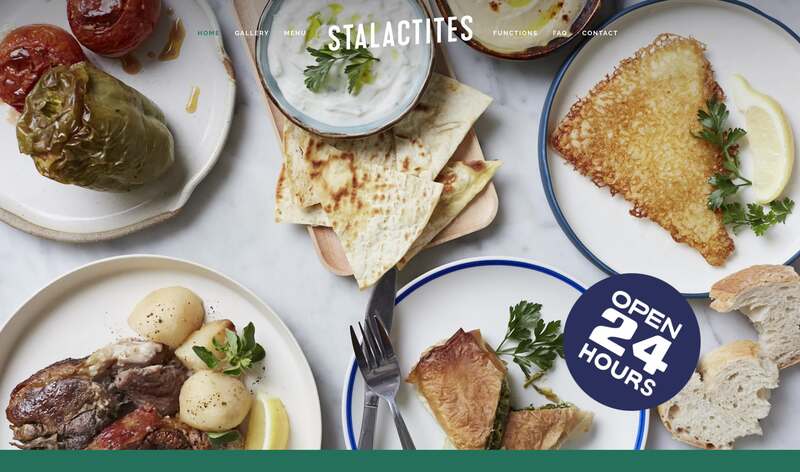 Family run for over 40 years, Stalactites serves great Greek fare 24 hours a day. Serving up some fresh ingredients alongside interiors by Bergman & Co, we introduced a new system of colour and typography across the suite of touchpoints, collateral, signage and online applications. We also developed a new website based upon the Squarespace platform, which is a great and cost-effective alternative to a completely custom build. This identity also incorporates some sweet historic touches to preserve continuity, such as retaining the painted signage treatment ‘Open 24 Hours’ and reusing it in new illuminated signage applications.